I’ve been enthralled by PAP ever since I heard about legendary Canadian Sprinter Ben Johnson squatting 600 lbs for 3 reps ten-minutes prior to his infamous 1988 Olympic 9.79-second world-record performance in the 100-meter sprint. Although Ben’s gold medal was later stripped due to a positive test result for performance enhancing substances (Stanozolol), and despite the fact that Johnson’s coach Charlie Francis stated that the incident was fictitious and never actually occurred, the story still peaked my interest. More stories involving PAP have surfaced from time to time in the Strength & Conditioning industry. For instance, researchers Gillich and Schmidtbliecher reported that a 1995 bobsledding team used MVC’s prior to competition to elicit PAP and subsequently won the world championship. As a final example, strength coach Tony Gentilcore recently utilized PAP to leap onto the stage at an Alicia Keys concert prior to his arrest. The first time I recall learning about PAP was when Charles Poliquin first started writing about it on T-Nation. Poliquin states that he first heard about PAP’s application to weight training (The 1-6 Principle) at a 1991 NSCA convention in San Diego from U.S. Weightlifting coach Dragomir Cioroslan. However, Poliquin mentions that it was first discussed in strength training circles in the early 1980’s after German strength physiologist Dietmar Schmidtbleicher’s work was translated to English. Other sources state that Yuri Verhkoshansky first introduced PAP to around forty U.S. and Canadian strength coaches in the summer of 1986 at the Moscow Institute of Sport. Regardless of where the principle originated, PAP has some very intriguing applications to sport training. In this article, I’m going to first shed some light on PAP and then offer some suggestions as to how it can be appropriately programmed into your training. What is PAP? Is it Different from Complex or Contrast Training? If you’ve been reading strength training literature for a substantial period of time, then chances are you’ve seen the acronyms PAP, PTF, PTP, and/or PAF. PAP stands for Post-Activation Potentiation. PTF stands for Post-Tetanic Facilitation. You might seldom see PTP, which stands for Post-Tetanic Potentiation, and PAF, which stands for Post-Activation Facilitation. How is PAP different from PTF? PAP involves voluntary contractions, such as a maximum isometric contraction or a set of heavy squats, while PTP involves involuntary contractions, such as those elicited by electric muscle stimulation (EMS). Obviously as a strength coach I’m more interested in PAP, as I’m not yet interested in hooking my athletes up to electrodes and zapping them prior to their explosive exercises. Sometimes individuals will use the terms “complex training” and “contrast training” in reference to PAP. Although strength coaches often have different opinions as to what complex and contrast training entails, PAP indeed forms the basis for both methods. Complex training involves combining biomechanically-similar traditional heavy strength training and plyometric/ballistic training methods in an attempt to transfer strength into power. Numerous studies and reviews including those by Ebben, Verkhoshansky and Tatyan, Adams et al., and Lyttle et al. indicate that complex training is equally or more effective than strength training alone or plyometric training alone in increasing explosiveness. In Neuromuscular Basis of Kinesiology Roger Enoka states that, “The magnitude of the twitch force is variable and depends on the activation history of the muscle. A twitch elicited in a resting muscle does not represent the maximum twitch. Rather, twitch force is maximal following a brief tetanus; this effect is known as posttetanic potentiation of twitch force.” This means that an electrical stimulation of the muscles can lead to a subsequently more powerful contraction. Here’s a simpler definition: PAP is a phenomena by which muscular performance characteristics are acutely enhanced as a result of their contractile history. The underlying principle surrounding PAP is that heavy loading prior to explosive activity induces a high degree of CNS stimulation which results in greater motor unit recruitment lasting anywhere from five to thirty minutes. There are many different ways to utilize PAP. In the past, legendary strength coach Charles Poliquin has recommended using wave-loading to induce PAP, popular strength coach/author Christian Thibaudeau has recommended using maximal isometrics for PAP, and popular personal trainer/author Chad Waterbury has recommended using supramaximal holds as a method to elicit PAP. While the science involving PAP is solid and makes perfect sense, prior research on PAP is equivocal. There have been plenty of studies showing that PAP works and plenty of studies showing that PAP doesn’t work. PAP research is most likely inconclusive due to the large number of variables involved in implementing PAP, which I’ll elaborate upon later in the article. How Does PAP Work from a Scientific Standpoint? How Does PAP Work from a Non-Scientific Standpoint? Why Doesn’t PAP Always Work? First, a max contraction will always generate fatigue and PAP at the same time. Fatigue attenuates or diminishes force-generating capabilities of the muscles while PAP potentiates or enhances them. PAP and fatigue develop and dissipate at different rates. Fatigue subsides at a faster rate than PAP, so potentiation of performance can be realized at some point during recovery period. The max contraction could enhance power and training effect via PAP, or it could induce fatigue. The balance of PAP and fatigue determines the net effect on performance of the subsequent explosive activity. Fatigue can be either central or peripheral. Isometric contractions lead to more central fatigue, but more peripheral PAP, whereas dynamic contractions lead to more peripheral fatigue, but more central PAP. Second, PAP may be more beneficial to single actions such as a max vertical or broad jump, a max throw or swing, or even a max isometric contraction rather than repetitive cyclical actions such as sprinting, cycling, or swimming. Third, the parameters of the variables involved in PAP may require tinkering and optimization. Forth, PAP may not work for certain individuals. I will expound upon the third and forth reasons later in this article. What is the Ideal “Window” of PAP? The optimal recovery or “window” of PAP depends on the decay-rate of PAP and the dissipation of fatigue. The coexistence of PAP and fatigue may result in a net-potentiated state, a net-attenuated state, or a constant state as compared to the prestimulus state. Some studies show increased power immediately following a max isometric or dynamic contraction. A performance improvement is indeed possible if initial peak PAP overrides initial peak fatigue. Performance may initially rise above baseline, then dip down below baseline, and then rise above baseline again before returning to normal over a ten minute period. Windows are immediately after a low volume contraction or after a specific recovery period for high volume contractions. An excellent journal article titled “Factors Modulating Post-Activation Potentiation and its Effect on Performance of Subsequent Explosive Activities” shows two theoretical “ideal windows of opportunity” for PAP. 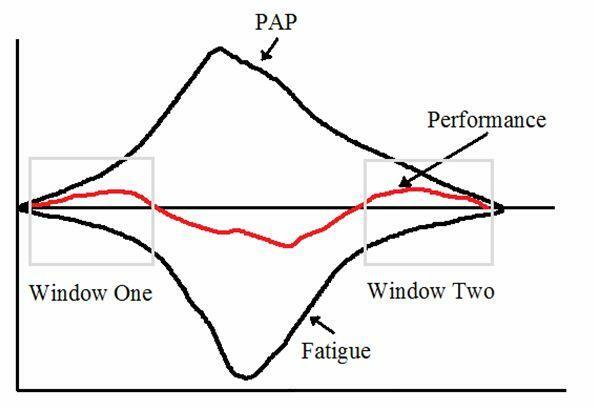 These windows illustrate periods where PAP exceeds fatigue and would therefore lead to a “potentiation” of performance. Following a low-volume maximal contraction, you want to perform the explosive activity immediately following the set. Following a high-volume maximal contraction, you want to wait several minutes before performing the explosive activity. An example of a low-volume max contraction would be a heavy single for squats. An example of a high-volume max contraction would be eight sets of five second isoholds separated by 40 seconds of rest in between sets. What Factors Influence the PAP-Fatigue Relationship? The parameters for the training variables involved in PAP have yet to be determined. Does PAP work for everyone? Research indicates that PAP is very specific to the individual. Some evidence shows that PAP works better in stronger individuals than weaker individuals (Gourgoulis et al., Kilduff et al.). Some research shows that PAP works better for more fast-twitched individuals in comparison to more slow-twitched individuals (Hamada et al.). Evidence points towards PAP being more effective in highly trained individuals (Chiu et al.). Some evidence shows that PAP works better for strong individuals who aren’t very powerful; ie: they have trouble converting their strength to power (Schneiker et al.). Finally, research indicates that not all individuals display increased phosphorylation following a max contraction (Smith and Fry). Furthermore, different muscles may have different rates of recovery in terms of fatigue and PAP. PAP appears to work better if the kinematics of the max contraction match the kinematics of the subsequent explosive activity. PAP appears to work best in activities involving type II fibers (Hamada, Sale, & MacDougall). Many PAP studies indicate a 2-10% improvement in performance, so this area indeed warrants further investigation. Why Does the Author Believe in Utilizing PAP? Regarding pure strength work, Poliquin utilized PAP for his 1,6 program. I’ve experimented with the 1,6 program and didn’t find that it worked well for me, but perhaps I fatigue easier than others, or perhaps there are other issues at play. Eric Cressey mentioned in an article that he didn’t buy into PAP in regards to schemes like the 1,6 program. I have a powerlifter-friend who swore by the 1,6 program. In this regard, PAP appears to work very well for some people and not-so-well for others (which jives with the research I listed above). As stated above, research indicates that PAP works better for more experienced lifters, those with more fast twitch muscle fibers, and especially for those who sit on the “static” end of the static-spring continuum (static being very strong, spring being very elastic and explosive). Most gym-rats like me are very “static” from years of heavy lifting. However, many individuals and athletes like to go to the gym one time per day and do not wish to perform multiple training sessions per day. Some are limited by time availability and are unable to perform multiple daily training sessions. In this case, I believe that PAP is one’s best bet for preserving or enhancing power while training heavy. I believe that performing more than one explosive exercise first in the workout diminishes the capacity to perform maximum strength work. Conversely, I believe that performing more than one heavy strength exercise first in the workout diminishes the capacity to perform maximum explosive strength work. For example, if one were to perform a few hard sets of squats, deadlifts, and barbell glute bridges prior to vertical jumps and sprints, his jumping and sprinting power would suffer and the athlete would feel like his feet were heavy and he was slower than normal. However, if one were to perform jump squats, power cleans, and sled pushes prior to heavy squatting, deadlifting, and hip thrusting, his strength would suffer and the lifter would feel that he did not maximize the strength component to his workout. Alternating the two types of activities in the form of complex training may therefore provide the perfect scenario. Personally, I love hypertrophy, I love strength, and I love power…I want it all. I am not willing to gain a ton of muscle at the expense of becoming slow. If all one does is medium-high rep hypertrophy training year in, year out, science indicates that that individual will become slower. This means slow punches, slow sprint times, and a pathetic vertical jump. By incorporating PAP at strategic times throughout the year, one can maintain or build power and prevent power/speed losses over the years. The best thing about incorporating PAP is that it doesn’t affect the training routine too much; it’s not very difficult to add in a vertical jump right after a set of squats or a plyo push up right after a set of bench press. Even if research were to one day show that PAP offers no for performance enhancing effects beyond that of a dynamic warm-up I’d still be interested in incorporating PAP into workouts due to increased training density. Strength coaches Mike Boyle and Nick Tumminello have written extensively about utilizing active recovery in the form of mobility, flexibility, and activation drills in order to increase training density. Perhaps combining a strength movement, a biomechanically similar power movement, and a non-interfering flexibility, mobility, or activation movement serves as the ultimate method to maximize workout efficiency while minimizing total training time. If you want to utilize PAP for short-term performance boosting purposes it would be very wise to actually test the individual to see if it works. Don’t assume that PAP works for everyone or assume that the same PAP protocol is best for each individual! What Would My Ideal Complex-Training Scenario Look Like? Combining squats and jumps is a no-brainer. 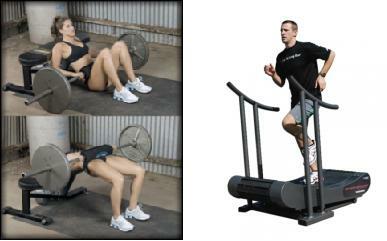 I really like the idea of combining hip thrusts and sprints off the Woodway speedboard as well. It’s not too often that you see any “core” movements utilized in PAP such as using ab wheel rollouts or woodchops to load up the anterior chain prior to throwing or swinging activities but I would love to experiment to see if it could lead to an enhancement of performance. Some exercises are well-suited for 1RM’s or heavy singles. These exercises include squats, deadllifts, bench press, and eccentric ab wheel rollouts. I believe that hip thrusts, glute bridges, good mornings, back extensions, reverse hypers, landmines, woodchops, and Pallof presses are better suited for reps of five. I’d try to keep the reps for heavy strength work under or equal to five and I wouldn’t be afraid to prescribe heavy singles. For subsequent explosive work, I’d stick to five reps or less as well and also wouldn’t be afraid to prescribe single efforts. For example, a heavy squat single immediately followed by a max vertical jump might work very well. I’m more interested in experimenting with low-volume contractions with little to no rest time as opposed to high-volume contractions with longer rest times. I wouldn’t quite “max out” or go to failure as I believe that grinding out a rep, exhibiting energy leaks, or pushing a set too far might lead to too much fatigue and prevent PAP from occurring. I’ve studied the muscle activation involved in form decrements such as squats with a serious forward bend or round-back deadlifts and the result is always decreased muscular involvement in the prime movers which is something you want to steer clear of in this instance. Furthermore, in studying muscle activation the second repetition of a set usually always results in increased muscle activation over the first rep, which is most likely due to the CNS “figuring out” the motor program. This plays a case for heavy doubles or triples for the max contraction used in PAP. In many instances one can maximize muscle activation by using 95% of 1RM and using picture-perfect form. This is what you want for PAP purposes – maximum muscle activation in the intended musculature. I’d use mostly bilateral lifts for the max contraction as unilateral lifts would take too much time to do both legs and interfere with the PAP window of opportunity. I’d use mostly bodyweight explosive movements for the subsequent explosive movements or movements with actual sporting implements as opposed to speed-strength or strength-speed exercises such as jump squats or power cleans. I’d try to mimic directional load vectors and joint angles to maximize dynamic transfer. Two tools that I’d love to experiment with in eliciting PAP are weight releasers and whole body vibration platforms. I’ve heard Rob Panariello mention the former methodology and Charlie Weingroff mention the latter methodology. I love reading review articles in the journals. While original research is great, review articles analyze previous research so one doesn’t have to go sifting through everything to try to get a grasp on a particular topic. In other words, researchers who write review articles do the work for you! By far my favorite review article on PAP is titled Factors Modulating Post-Activation Potentiation and its Effect on Performance of Subsequent Explosive Activities by Australian researchers Neale Anthony Tillin and David Bishop. If you are interested in learning more about PAP, then this article is a must-read. Seriously, the article is amazing! Do yourself a favor and read it. Two other excellent review articles are Postactivation Potentiation and its Practical Applicability: A Brief Review by Canadian researcher Daniel Robbins and The Application of Postactivation Potentiation to Elite Sports by D Docherty and MJ Hodgson. Below you will find links to articles regarding PAP from various strength experts. Just click on the name and you will be taken to their article. From a practical standpoint, Nick Tumminello’s article will give you the most training-related ideas. Another excellent post. I appreciate the effort man. I have a love-hate relationship with your blog. I obviously love the educational content, but I absolutely hate how much extra stuff I always find myself adding on to my “too read” list, if only because I already find myself adding so much to it that your attention to detail tends to provide a significant bit more…………………when it comes to posts, you’re always no fluff and pure quality content, so thank you for that! The following comment that you made seems to be the most valuable of all and sum up how any method should truly be evaluated by any coach. Regardless of what any formal research says, at the end of the, if something works for an athlete, it should be kept, regardless of why (even if an effect would be dubbed “placebo” in any given case). And if it doesn’t work, it either needs to be tossed aside, given a bit more trial time, or midified to see if a change is needed to make it work. If I may, I’d like to direct a few questions your way. 1) A fair amount of focus was paid to the use of PAP when sequencing a power movement after a heavy strength one. Now while this may be the more conducive order for power, do you generally like the use of explosive movements mixed in before heavier, more hypertrophy-focused work, despite some indications that there may be potential to impair adaptations? While I may occasionally use an explosive movement and complete all sets prior to a heavier movement, for this question, I will refer to alternating an explosive movement with a heavy movement. For example, Perform 3-5 reps of an OH Med Ball Slams/Stomps (or supine throws if you’re feeling like a real bodybuilder that day and have someone to “fetch” each throw) and then follow it up with 3-6 reps of chin-ups (or even machine pull-overs..I’ll throw this in since I train at a neighborhood gym that has one and is set up to allow easy pairing of these types of movements, as opposed to most commercial settings). I’d have suggested Straight-arm pulldowns or decline rop pullovers, but those don’t lend themselves well to lower ranges that would most benefit from any PAP effect….plus you could always finish off with those as a tertiary movement anyway. I’ve also seen this alternating order used with supramaximal holds mixed in between heavy sets of a movement (or either functional isometrics or overcoming isometrics from the strongest position used in between…..or possibly even 3 x 3-second overcoming isos instead of one 6-10 second iso). So basically I am just curious if this (again tracking to assess as opposed to just assume it is or isn’t working) is likely still a very viable method for increasing HTMU recruitment to enhance hypertrophy work, particularly “functional” hypertrophy. Unless you took a fair rest after that effort, would a double with around 90-percent be almost or as good without incurring quite as much central fatigue? or is a double at 95-percent before an explosive effort more than doable for a well-trained person if enough time is allowed for between the heavy and explosive efforts? 3) You mentioned not personally being willing to gain more muscle if it meant becoming slower, but while maintaining power/RFD as we age is/should be a concern for any person (separate from your desire or the desire of others to not be slow in the athletic sense of the term), do you feel there’s anything wrong with guys who are strictly concerned about building as much muscle as possible while limiting any negative postural implications and don’t care much about power, per se? Now I realize that to some degree, improving RFD will be a beneficial thing for hypertrophy, but I am mostly getting at building a physique even if you may be less athletic than you could be at a smaller size. As far as losing RFD as we age, I figure that if someone spends a lifetime of lifting and does so smartly, he’d maintain more power than your typical senior citizen even without focusing on what a strength coach would consider true power work. Obviously I think that bodybuilders can and should work power work in at points where it can enhance what they are after while also deriving benefits they may not directly be after, but this is, again, mostly about your thoughts on guys who would trade bigger for a bit slower (if they had to make a trade off) and are primarily focused on size and general function/joint health/and a long bodybuilding/lifting “Career”. You seem like the guy to ask, because while you have your own goals and focus, you’re a guy who never makes one size fit all, and you never project your goals onto those of others. In short, you’re highly educated but lacking in the typical biases that tend to be encountered in these allied fields. Sorry for the monster comment/questions post, and thanks again for your time and for sharing your wisdom and insight! Joe – Great comments and questions! I have a love-hate relationships with my blogs too so don’t worry about it. 1) I personally don’t find that power movements “prime my pump” or “ramp up my nervous system.” For example, I don’t like doing jump squats before squats or power cleans before deadlifts. That said, I have spoken to so many individuals online and in the gym who do believe that this method helps them out. So if it works for you; by all means do it! This is another one of those things that is highly dependent on the individual. I like your thought process and ideas on this topic. I am pretty “old school” when it comes to hypertrophy and personally don’t believe one should tinker around with PAP or explosive movements in general if going for maximum muscle-building. Rather, I believe that one should go for constant tension on the muscles with medium-rep straight sets on heavy compound movements and higher-rep sets on isolation movements. Just my opinion! 2) I have nothing against folks who are solely concerned with hypertrophy and don’t give a damn about strength, power, or athleticism. In fact, most of my friends feel this way. I don’t think it’s dangerous and I think that as long as someone who trains this way foam rolls, does mobility drills, has good strength balances, uses good form, and rotates lifts, then he or she can perform many of the commonly-believed “dangerous” exercises that are questioned in the strength training industry. Fpr example, the occasional performance of flies, pullovers, upright rows, behind neck presses, heavy weighted dips, etc. is okay as long as you don’t do them every week and meet the criteria listed above. Certainly bodybuilders are far more powerful than couch potatoes due to increased CSA but far less powerful than they could be if they trained for explosiveness. The problem is that plyos and explosive movements are dangerous when you’re huge and can actually impede hypertrophy gains as you really want to focus on gaining strength in medium rep ranges and getting a good pump in the intended musculature. I know that this flies in the face of what many gurus recommend but I read Muscular Development Magazine each month, I have many bodybuilding videos, I speak to many of the bodybuilders at my gym, and I have tons of training and personal training experience. I intend to write a blog on this topic in the future. There was a time when I believed that bodybuilders should train more like athletes but now I know better. Bodybuilders should train like bodybuilders but they should incorporate more stretching, mobility drills, and foam rolling and optimize their exercise selection and program design in order to prolong their lifting careers. Bret, I’ve been a CSCS for 14 years, and I’ve had my Master’s for about 4 years. I have done a lot of research on PAP and it is the cornerstone of my programs that I prescribe to my athletes. I have had great results using it and playing around with it. Outstanding blog!! Man… that is a load of great info! Great post, so much precious info! Here is a very brief video of Gunthor Werner doing complex training. Awesome video Thierry! Thanks for the link! Great article, hoping to incorporate some of your suggestions into a Msc research thesis, il keep you informed! I am a fan of your and would like to add some input to your PAP article. I’ve used Complex Training/PAP for powerlifting since 1998. Tom Morris, CSCS and I have co-written a few magazing strength training articles. I began applying Complex Training/PAP after Morris gave Ebben’s NSCA article “A Review of Combined Weight Training and Plyometric Training Modes: Complex Training”. I had geat results with it. In sending it to Mike LiftingLarge.com to post there are some typos that occured for some strange reason. Bret, like you, I mistakenly accepted Poliquin’s information on Ben Johnson’s using heavy squats weight prior to his sprints in our article. I later found out Poliquin’s information was incorrect. In an interview in which Charlie Francis (Johnson’s sprint coach), Francis was ask about this. Francis stated Johnson never squatted heavy prior to any sprint. Kim Goss is a strength coach and editor for Bigger/Faster/Stronger. Goss edits other work like Poliquin, Dr Donald Chu, etc. In a converstation that I had with Goss, Goss told me that Poliquin’s information on Johnson’s squatting heavy prior to sprits was incorrect, as well. Goss said Poliquin didn’t make mistakes like that but did on that article. Goss didn’t edit that artcile for Polquin. Here is how I have successfully applied Complex Training/PAP to my powerlifting. Partial Belt Squats Plyometric Box Squats w/Band. I disagree with your statement that Good Mornings are “better suited for reps for sets of five”. I keep Good Mornings in the 1-3 range. I also eliminate most the eccentric part of the Good Morning. I allow the bar to pretty much free fall back down to the rack pins or the bar suspended from a set of car straps hanging from the power rack. Car straps are the “Original Spud Straps”. I allow the bar to drop in the Good Morning because there is not much of any eccentric in a deadlift nor Olympic pulls for that matter. Secondly, I don’t believe that the lower back responds well to a lot of stress, especially eccentrics for most individuals. Using Complex Training, my best squat at 210 lb body weight is 255 kg/562 lb, bench press 172.5 kg/380 lbs and 280 kg/617. Thanks for the comment Kenny! I appreciate your views on the topic. I keep reading this article over and over again……..Bret, is there any chance to use something like a ‘Reverse PAP’ ? e.g. Could pre-coutermovement jumps performance enhance the ability to subsequently apply more vertical force to the ground during the Back squat exercise? COMPARISON OF DIFFERENT STRENGTH TRAININGS METHODS FOR THE DEVELOPMENT OF POWER. Hope you are well and your PhD is ticking along. I enjoyed reading the blog on PAP. I am currently putting a randomised cross sectional counterbalanced design study together on PAP. While I understand the theory and physiology behind it I am not sure how it is used by S&C coaches regarding multiple cycles. For example in a 1 hour training session how many times will a coach get the athlete to perform the heavy strength activity before the power activity/activities? The research I have read shows the PAP effect is best after 4 min and can last up to15min post. Is PAP performed once in a session (i.e. at the beginning) or performed multiple times in a session (i.e. every 20 min or so)? Does the PAP effect diminish during multiple cycles or can it be maintained? Futhermore do loading increments change to account for muscular fatigue through the session? e.g. 1st heavy squats performed at 85%, 2nd heavy squats at 75% and so on? I would like to investigate the acute responses manipulating rest and load but also the multiple cycles of PAP application in a rugby specific training session. However my understanding of PAP application is limited. Your feedback on this would be appreciated. Regards, Paul. I’ve experimented with the PAP principle since the late 80’s, coming from an athletic background. I find that it works very well. My personal preference is to do a set of heavy squats(x 1-3reps), 90sec recovery, followed by a set of depth jumps (x3reps), 3min recovery x 3-5sets. Or use deads with seated box jumps, or cleans/hang cleans with seated box jumps. Same sets/reps and recoveries as above. The same principle also works well with bench and depth push ups. The PAP principle also works very well with sprints – 20m-60m at 95%-100% effort followed by a set of depth jumps. Although I usually finished the entire set of sprints first. eg 3 x 3 x 60m followed by a 8-10min recovery and finsih off the session with 3-5 x 3-5 depth jumps with 10sec between reps and 3-4mins between sets. I’ve also used these principles with triple sets eg Heavy squat/squat jump/depth jump or heavy or speed deadlift/power cleans or hang cleans/seated box jumps with something like 3min revovery/90sec recovery/4-5min recovery – repeat cycle x 3. You can also mix them up by doing squat jump/heavy squat/depth jump or power clean or KB swings/speed deadlift/seated box jump or depth jump for distance emphasizing hip dominance. What I find with these methods is rapid increases in both strength and power as well as speed when used in conjunction with sprint training. Great article. Good resources and well presented!